I receive an overwhelming amount of calls during the influx of folks on vacation in and around Bryson City during the summer season. The tourist season usually is at the peak of June, July, August, and October. The best trout fishing seasons for the Smokies is at a lull at best during these hotter months of summer. The longer days and the higher sun angle heats up the water temps into the 70’s on a regular basis during June and July especially. Trout need cold water to be happy! The dissolved oxygen becomes lower when the water temps warm up. This adversely affects their ability to breath! This stresses the trout greatly and leads to a high mortality rate on rivers like the Delayed Harvest section of the Tuckasegee. During the past two weeks, air temps are in the 90’s with the water tables very low due to rain deficit. If you venture out this time of year you can find water temps in the low 60’s at daybreak for the streams in the Smokies. During the summer months, the typical clients change dramatically from the discerning anglers that come during the better trout seasons. Spring and fall clients come to fish for their vacations. Summer folks arrive on vacation to escape the heat where they live further south. Summer crowds are here to zip line, whitewater raft, horseback riding, mountain biking, trail hiking, waterfalls and other outdoor adventures. 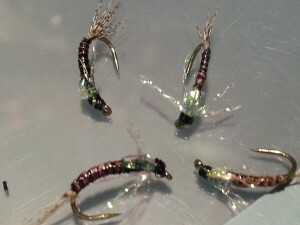 Fly fishing is not the main reason they are here during the summer! I have witnessed this cycle for over thirty years living in Bryson City. I love living in Bryson City, NC because the outdoor activities are numerous! The amount of advertising on social media portraying Western North Carolina as the fishing capital of the south is not all that it is made out to be during the summer months. There are many well-written articles and information provided on the internet but due to the lack of Google police, many things are simply not true! Many of our most popular angling streams serve whitewater rafting, tubers, and other distractions for the overall fly fishing experience. Sure you can seek out the coldest streams still, like the Nantahala River which is a tailwater. Add to the mix that the Great Smoky Mountains National Park is the number one most visited National Park in the nation with an average of 14 million folks annually! The Nantahala temps stay in the mid 50’s all summer long. June and July are peak season for whitewater rafting. It is the second most popular river in the nation with numbers of people for white water rafting. If you venture out to the Nanty, be warned that practically every boat that comes by will ask “if you are having any luck”. If you venture out to the Nanty, be warned that practically every boat that comes by will ask you “are you having any luck”. Add to the mix that the Great Smoky Mountains National Park is the number one most visited National Park in the nation with an average of 14 million folks annually! The majority of the National Park lies in Swain County. Land your fish quickly and help revive it during the hotter months. Revive your trout during the hotter months by facing it upstream and moving it back and forth in riffle water. So often during the hot seasons, the trout may swim off and look fine. Check back in a few hours and it has perished. To help ensure survival is high you must land it quickly and spend a little time for reviving on each and every fish! Also, best to not fish for trout once temps hit in the 70-degree range. 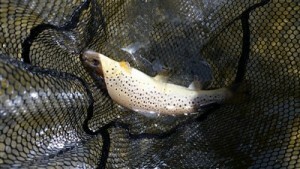 However, on the plus side, you can still learn about trout fishing for an on-stream experience. This experience can be beneficial for learning to fly cast, rigging, reading water, hooking and playing fish, and other on the stream tactics. So if you venture out to explore new waters in the area during the hotter summer months make sure you buy a thermometer and actually use it to find cool water. On the wild streams, you can find better fishing at daybreak with temps still in the low 60’s. Best of luck!